What is a Soundproof Crate? Why Soundproof a Dog Crate? What if I Want to Soundproof a Kennel? There are several reasons you may be looking into soundproofing your dog’s crate and fortunately there are multiple ways of doing this so no matter what your budget, timeline or living situation we can help you solve the problem with ease. Soundproofing a dog crate is a fantastic way of reducing noise levels within your home, not only in regards to your dog barking but also for keeping your dog safe and relaxed during loud events such as fireworks. A soundproof crate helps to absorb the noise, reducing the intensity and helping to relax your dog. A soundproof crate is a crate made from materials that absorb sounds so, for example, when your dog is inside it will reduce and block the sound of your dog barking, to a point at least. It doesn’t silence the noise completely but will reduce it. This is because to silence the noise would cause an uncomfortable and hot environment for your dog. The majority of soundproof crates help to reduce the sound, eliminate reverberations and echoes and take the intensity out of your dog’s bark. Most crates can be transformed into soundproof crates with very little effort, you can also purchase crates that have been specifically made with soundproofing properties. Soundproofing can be beneficial to your dog as well as to you. The crate will be able to minimize the sounds that your dog can hear, this means it can be a safe space that muffles the sound of thunderstorms or fireworks and reduces anxiety for your dog. Your dog is much less likely to bark if they feel relaxed and a soundproof crate can help to achieve this. A soundproof crate can also help you deal with an issue of constant barking or demanding attention, although remember a dog will often bark if there is something bothering them. 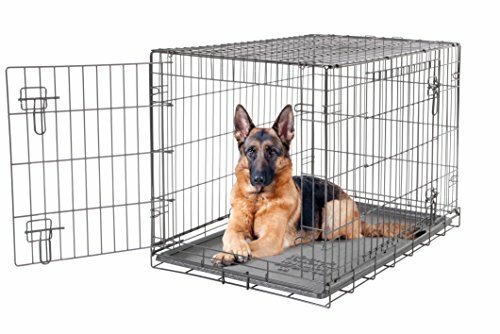 Dog crate covers are a simple, inexpensive way to soundproof the crate. You simply need to cover your crate with the cover of the right size and it will help to keep noise levels down. It is best to buy covers that are specifically manufactured for this use as the material will be breathable to ensure the crate does not get too hot for your dog with the covers on. The covers will help to reduce the amount of sound getting in and out of the crate and they will be easily removable and washable too. Dog crate covers are widely available but not all are specifically created for sound reducing. If you are looking for a quick, temporary solution you could put a blanket over your dog’s crate but take care that this doesn’t cause the crate to become too hot or too dark. Absorption sheets are another low cost way to soundproof a crate. They help to absorb mid-high frequency sounds and reduce echoes too. Absorption sheets are easy to fit and often just mount onto the walls of the crate. This is an easy solution that does not require any tools to fit. For the absorption sheets to be effective they must be the right size for your dog crate. Another option is to cover the crate with moving blankets. This is a cost-effective solution that helps reduce sound with ease. 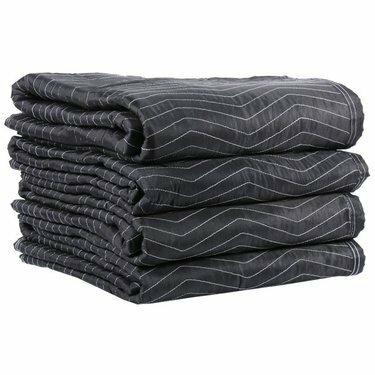 A moving blanket has the ability to absorb sounds which is why it is different from a regular blanket. The design of a moving blanket means they are able to absorb noise, insulate and still be comfortable. They are easy to clean and you can simply put one or two over your dog’s crate to help reduce the sound, you can even fold one up and put it on the bottom of the crate as a comfortable bed for your dog. Just make sure the crate is well ventilated and does not get too hot. If you have tried these solutions and are looking for something more, or you/ your dog doesn’t like the crate, or if your dog only barks when you are out and it disturbs your neighbours then you may decide to soundproof a wall or room of your house. This is a great idea especially if you have a shared wall with your neighbours. Although this is a much more costly option than soundproofing a crate, a soundproof room can give you peace of mind. Temperature – This can be a problem if you use regular blankets to cover the crate, leave the crate in sunlight/ near a radiator or leave the crate with little ventilation.Take care when choosing a position for the crate and be sure to use the correct material for sound proofing. Without breathable material and good ventilation, the crate could get very hot very quickly and this can cause discomfort and even sickness for your dog. Poor Ventilation – Generally material that has been made specifically for this purpose should not be a problem but always be sure that soundproofing the crate has not caused poor ventilation. Blackout – a darker crate should have a relaxing effect on your dog. A darker, quieter area for them to spend time in is a good thing but what you do not want to do is black the crate out completely. A completely blacked out crate can cause stress and confusion for your dog. If you would like to soundproof your dog’s crate because they are barking a lot, let’s also look at ways we can reduce the barking. One of the most important things is that your dog feels comfortable in the crate. Your dog may be barking because they feel frightened. Generally, dogs will be more vocal if they are afraid so to help reduce the noise, ensure your dog feels safe in the crate by reassuring them and making sure they know the crate is a safe and comfortable environment. Do not make the crate a punishment as your dog will develop negative associations and anxiety around being in the crate. You can increase positive associations with the crate by offering your dog a treat whenever they go into the crate and praising them for good behavior when in the crate. It’s best to get your dog comfortable and familiar with the crate before you start leaving them in there too. Dogs can become distressed when you are going out. To make this easier, you can leave the house quickly without fussing and hugging your dog lots before you leave. The emotion stirred up in drawn out goodbyes could cause your dog to bark and cry long after you’ve left. Maybe next time you’re going out, try to leave them by giving them a stroke and a treat, the treat will distract them as you are leaving and will make the situation easier for your dog to handle. A tired dog will likely not spend hours on end barking, they should instead spend hours on end sleeping. So, if you want to relax and have some quiet time the best thing to do is take your dog out to have a run in the local park. By the time you’re home and you put your dog into the crate, they should be tired and ready to relax. Playtime is also a way of tiring out your dog, get them a toy and spend some time playing tug of war, fetch or give them a toy that releases treats as they play. As it is important your dog feels safe in the crate it is helpful to position the crate in a familiar and comfortable location. Placing the crate in a room your dog does not know such as the laundry room or basement may cause them to feel agitated and bark more. By placing the crate in the living room or somewhere familiar your dog will be much more likely to relax. Integrating the crate into training is another way you can help bring discipline and good behavior into the routine. Teaching your dog to go in the crate and stay there will help them to stay in the crate in the future without barking and whining to be let out. This also makes the crate a familiar environment for your dog. Soundproofing a kennel will require different methods from the crate methods described above. Acoustic tiles adhere directly onto the walls/ ceilings and are designed to absorb the noise. Generally, acoustic tiles are made from recycled cotton and will substantially reduce the echoes heard from the kennel. Although the barking will still be heard, it’s intensity and impact will be significantly reduced. There are often many colours and designs to choose from when using acoustic tiles so you can create a pleasant environment while still reducing the sound heard from the kennel. Acoustic panels are another great choice when you would like to soundproof a kennel. Acoustic panels are available in a wide variety of fabrics and designs. These panels offer effective sound absorption, particularly with absorbing sounds of mid to high frequencies. Acoustic panels are often used in spaces such as sound recording studios because of their sound absorptions capabilities and can be effectively used in kennels too! There are many reasons you may choose to soundproof a crate, kennel or room. Whether it is to reduce the intensity of your dogs barking or to help relax your anxious dog, whatever the reason there are several options available. The options vary in price and complexity so there should be a solution to suit your requirements. Make sure you take care when soundproofing your dog’s crate to ensure maximum comfort for your dog while also achieving noise reduction.